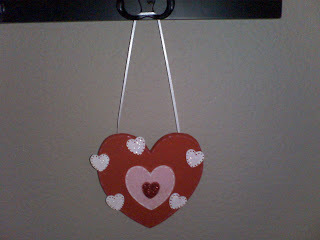 Some of the crafts I am about to share with you were made at Crafternoon or were inspired from Crafternoon. You can relish in my sickness and take some of these ideas and incorporate them into your decorating, or you can point and giggle at how nerdy I am. Either way, there will be more postings like this one in due time. On the pot I painted “Love is…” and then wrote things our family loves on the large, light pink hearts (family, pets, xoxo, etc.) 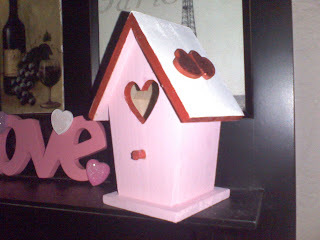 You can find out how to make this by visiting Ashley‘s blog. 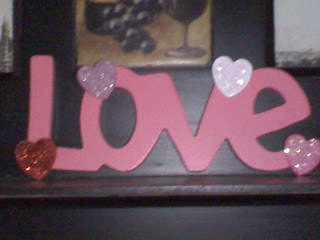 I bought a $1 wooden heart from Michael’s and painted it. 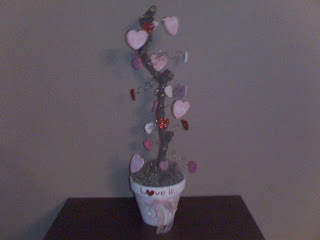 Then I added my extra glittery, wooden hearts I had left over from the “Love is…” Tree with a little hot glue. I took a piece of thin white ribbon and hot glued each end to the back of the large wooden heart so that I could hang it easily. By the way, I heart my hot glue gun. I use it on everything. Back to the craft…I went back with puff paint to add more details (to mimick thread stitches). And last, but not least, I added glitter to the heart in the middle. I heart glitter, too. 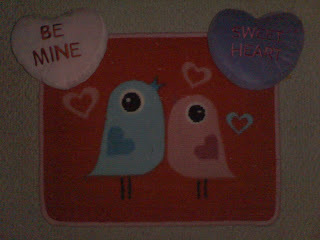 I got this Love cut out from Michael’s for $1. I spray painted it and added more of my extra wooden, glittery hearts from the “Love is…” Tree with the infamous hot glue gun. Simple, easy, cute. Love. I found these 2 pillows and rug at Target’s dollar spot. The pillows were each a $1 and the rug was $2.50 (big spender…I know). Tomorrow is the Monday, so that means I am off to get my beauty sleep. I have to tend to an almost 2-year-old in the morning as well as 28 darling third graders :) Happy Monday!